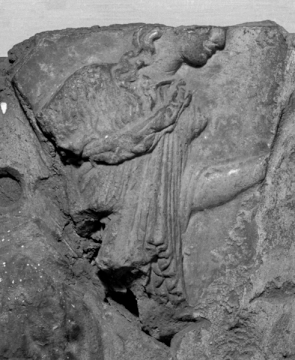 Part of the head, shoulders, left arm, and body of a young woman wearing a chiton and himation arranged in archaistic folds; two thick locks of hair hang down over her right shoulder. 1 H. Von Rohden and H. Winnefeld, Die antiken Terracotten (Architektomische römische Tonreliefs der Kaiserzeit), IV, pp. 212-214, pls. IX, CXI.